Sakai Guides and DocumentationSakai Complete User Guide Tests and QuizzesHow do students submit an assessment (i.e. test or quiz)? Use a supported web browser, such as the most recent version of Firefox, Google Chrome, or Internet Explorer. Make sure that you DO NOT have multiple windows or tabs open while testing. Make sure that you have a dependable internet connection; wired rather than wireless if possible. DO NOT use your browser back and forward buttons. Always navigate within Sakai. For timed tests, remember that once you begin the test, the timer will continue to count down. This is true if you lose internet connection, your browser crashes, or you simply exit and close your browser window. Make sure that you only click on the Begin Assessment button ONCE when starting a test. Make sure that you only click on the Submit for Grading button ONCE when submitting a test. Click on the title of the assessment. Zoom: Click on the title of the assessment. In the Assessments section, click on the title of the assessment that you want to take. Note: Assessments which are past the due date but still available for late submissions will appear in the list with the Due Date/Time shown in red. Assessments which are not currently available do not show up in the Assessments list at all. Or, your instructor may have linked to the assessment from other tools in the course, such as Lessons. Zoom: Or, your instructor may have linked to the assessment from other tools in the course, such as Lessons. Click on the link to the assessment to go to that item. An introductory screen will display which contains summary information about the assessment, its due date, the time allowed for the test, and the number of submissions allowed. If your instructor has enabled it for your assessment, you must check the box next to the Honor Pledge before you can begin. When you are ready to start your assessment, click Begin Assessment. Note: Make sure that you are ready to begin your test before clicking Begin Assessment. If it is a timed test, you will need to submit your test within the time limit or else it will be automatically submitted when your test time expires. If allowed in the quiz settings, you may click the Table of Contents button to jump to a different question in the assessment. If the test is timed, the time remaining will display at the top of the assessment. You may click the Hide/Show Time Remaining button to show or hide the count-down clock. The question will display below the count-down clock. Select your response or enter it into the fields provided. If allowed in the quiz settings, the Question Progress panel will appear on the right side of the screen. This panel will display your progress of answered and unanswered questions as you go through the assessment. 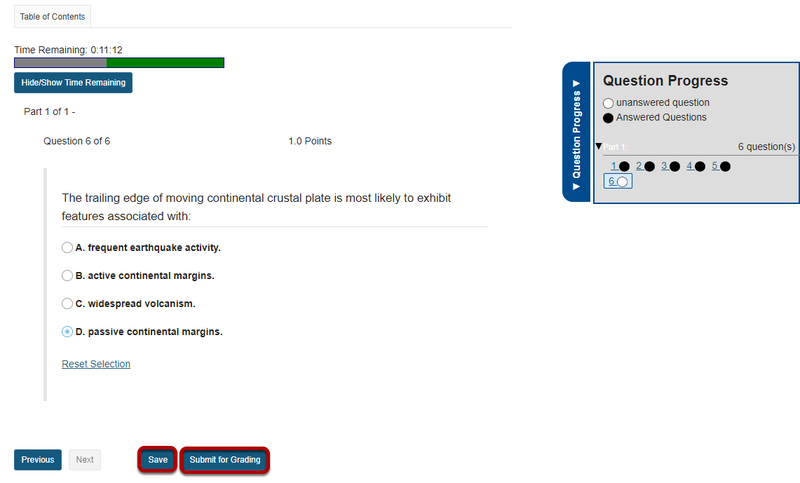 You may also navigate through the assessment by clicking on the question numbers in the panel. Expand or collapse the panel by clicking on the Question Progress tab. If allowed in the quiz settings, you may use the Previous button to go back to an earlier question. After you have answered the question, click Next to save your response and advance to the next question. You may also click Save on any question to save your answer. When you have answered all of the questions in the assessment, click Save and then Submit for Grading. You will be prompted to confirm that you are ready to submit the test. Click Submit for Grading to submit your assessment. Once you submit, you will see a submission information page with a confirmation number for your submission. 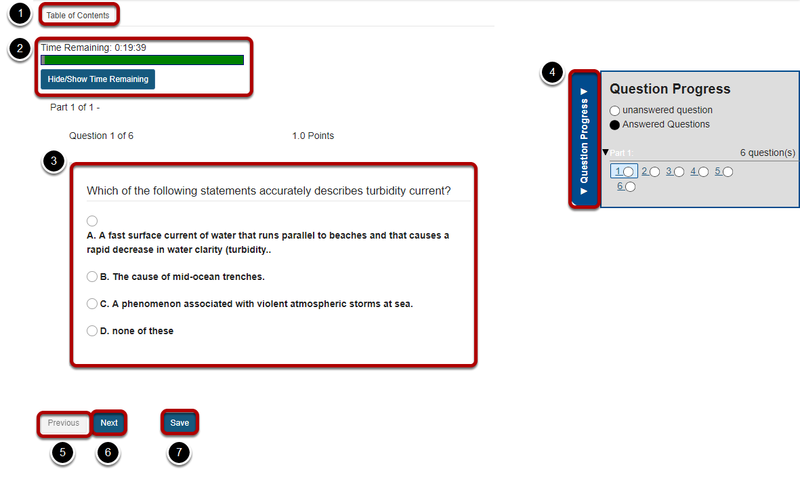 Click Continue to return to the Tests & Quizzes page. Prev: How do I allow a student to retake a test or quiz? Next: What information is in a Tests & Quizzes email notification?